Want to Post a Discount for Your Escape Room on our Site? We recently added a new feature to the site for Escape Room owners and managers. Now, by clicking here, you can send us a request to add a discount code to the site! (You can also find this on our header bar as a sub-menu to “Discount Codes.”) We are offering this as a service so you have an alternative from using Groupon. All you have to do is fill out the form and one of us will contact you to ensure it’s a legitimate request from an employee or owner. If you know someone who owns a room or works at one, please share this post with them. The more discounts, the merrier! We have a page of discount codes from companies that we’ve worked with or visited in the past, but have decided to offer this service to any legitimate escape room location so you can help spread the word about your rooms. Your discount will be posted on our Discount Codes page, as well as be put into the rotator on the right navigation (in alpha order). *Disclaimer: the Escape Room Guys offer these codes as an additional bonus to our readers, and we do not monetarily benefit when those codes are used. 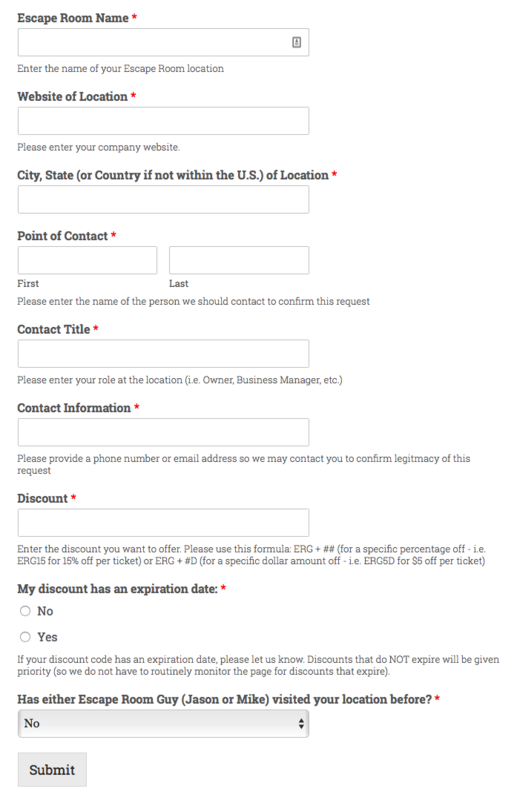 A screenshot of the form is below.